The Journal of Australian Studies (JAS) is the journal of the International Australian Studies Association. JAS is a fully refereed international quarterly, which publishes scholarly articles and reviews on Australian culture, society, politics, history and literature. The editors are particularly interested in multi and interdisciplinary work. First published in 1977, the journal is now published by Taylor & Francis. Special Issues: Each year JAS has special themed issues. If you are interested in proposing an issue please contact the editors. The John Barrett Award for Australian Studies is awarded annually for the best written article published by the Journal of Australian Studies (JAS). The award is administered by the International Australian Studies Association. The award comprises a cash prize of AUD$500 plus a two year membership to InASA (including a subscription to the Journal of Australian Studies). Bartlett, Alison and Margaret Henderson, ‘What is a Feminist Object?” Feminist Material Culture and the Making of the Activist Object’, Journal of Australian Studies, Vol.40 No.2 (June) (2016): 156-171. Bartlett and Henderson take up an ambitious analytic project. While focussing on defining feminist objects, this is more than an exercise in categorisation. Drawing on Baudrillard, Susan Pearce and others the essay provides an original contribution to museology in a number of ways. They provide a compelling argument and illustrations of the essentially political nature of feminism and thus the shifting dynamic of collections of feminist objects. Mosmann, Petra, ‘Encountering feminist things: generations, interpretations and encountering Adelaide’s “scrap heap”’, Journal of Australian Studies, Vol.40 No.2 (June) (2016): 172-189. Petra Mosmann’s article offers a rich meditation on relationships between feminist objects, institutional responses and feminist scholarship, highlighting the changing significance of objects over time and generations. Objects that meant a great deal to her activist forebears are unfamiliar to the author who is tasked with constructing a feminist archive from the scattered ‘scrap heap’ of second wave feminist objects — banners, badges, posters and papers. She reflects upon the way that ‘touching history’ can produce an intimate encounter that not only evokes both memory and futurity but also provides opportunity for the ‘re/making of feminist identity’. Irving, Nick, ‘Answering the “international Call”: Contextualising Sydney Anti-Nuclear and Anti-War Activism in the 1960s’, Journal of Australian Studies, Vol.40 No.3 (September) 2016: 291-301. Nick Irving makes a new contribution to scholarship concerned with ‘peace movements’ and anti-war protests in twentieth-century Australia. While it has been previously assumed Australian activist traditions were exclusively influenced by the radical forms of USA New Left responses to the Vietnam War, Irving demonstrates how Australian movements also drew inspiration from non-violent and legal forms of activism from the British Campaigns for Nuclear Disarmament. John Barrett Award: Open Category. Kumi Kato, ‘Australia’s Whaling Discourse: Global Norm, Green Consciousness and Identity’, Journal of Australian Studies, Vol.39 No.4 (December) (2015): 477-493. John Barrett Award: Postgraduate Category. 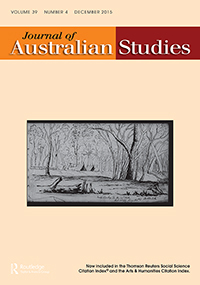 Chelsea Barnett, ‘Man’s Man: Representations of Australian Post-War Masculinity in Man Magazine’, Journal of Australian Studies, Vol.39 No.2 (June) (2015): 151-169. John Barrett Award: Highly Commended (Open Category). Alana Piper, ‘“I’ll have no man”: Female Families in Melbourne’s Criminal Subcultures, 1860-1920’, Journal of Australian Studies, Vol.39 No.4 (December) (2015): 444-460. Subscriptions to JAS are $105 per year. Subscription comes as part of InASA membership. JAS subscribers receive other benefits such as discounts to conferences. Click here to download a membership form. JAS is published by Taylor and Francis.